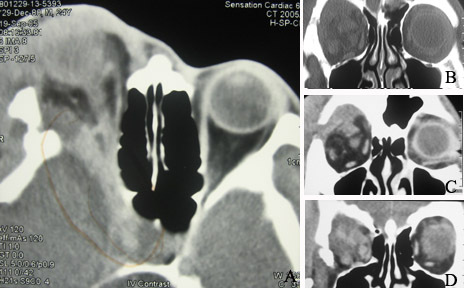 This 21-year-old with type 1 neurofibromatosis presents with a four-year history of a right progressive non-axial painless proptosis and swelling around the orbit (Figure 1A-D). Examination reveals a non-pulsatile exophthalmos. The right eye is only light perception due to corneal scarring from years of exposure keratopathy and possible optic nerve compression. The left eye has normal vision and slit-lamp shows multiple Lisch's nodules. His past medical history includes three temporal operations for plexiform neurofibroma and a Fasanella Servat operation for right ptosis. He works as a welder and his main concern is his inability to wear the eye shields to protect his left eye due to the left orbital mass. Figure 1 Right non-axial proptosis and swelling around the orbit. a. What are the eyelid abnormalities seen in these pictures? He is keen for surgical excision of the mass to allow him to wear shield during welding and also to improve his appearance. CT scans of the orbit are shown below. Figure 2. CT scan of the right orbit. b. What are the main abnormalities seen in these CT scan? 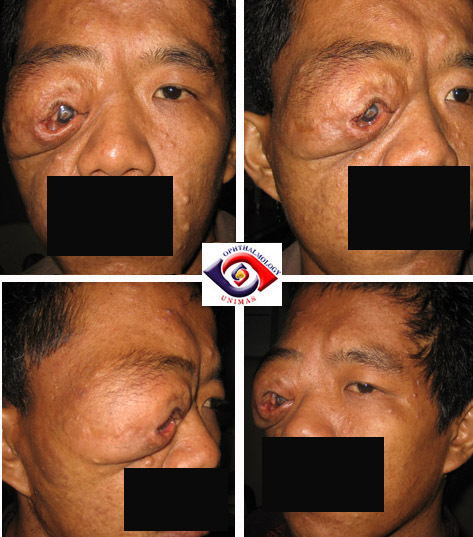 c. How would you reduce the mass and improve the appearance of this patient?